New data released by the US Census highlight the pervasiveness of poverty nationally and in North Carolina. In 2013, one in six North Carolinians lived below the federal poverty rate – less than $24,000 a year for a family of four and $12,000 a year for an individual. For communities of color, the poverty rate is far worse: 32.5 percent for Latinos, 28.9 percent for American Indians, and 28 percent for African Americans. These daunting poverty rates highlight that far too many individuals and families across the state face economic hardship. The persistence of poverty has been accompanied by a rise in income inequality, which poses consequential implications for the overall economy and North Carolina’s state economy. The bulk of economic gains from the ongoing economic recovery have flowed to a small group of high-income earners. In the first three years of the economic recovery, the top 1 percent of income earners captured 95 percent of the income gains nationally. Here in North Carolina, income for the top 1 percent of income earners in the state grew by 6.2 percent from 2009 to 2011 while the bottom 99 percent saw their income decline by 2.9 percent. The latest US Census data show that this early post recovery trend is likely to hold. By 2013, the top 20 percent of households in North Carolina captured more than half of all income earned by all households in the state (see graphic below). This skewed distribution of economic gains is not a recipe for a thriving economy that works for all. As more and more of the economic gains flow to a small group of individuals, the ability of a broad consumer base to spur economic growth in local communities is limited. Consumer spending is a major driver of economic activity in the US – representing around 70 of gross domestic product. A less skewed distribution of economic grains would put more income into the hands of low- and middle-income households. 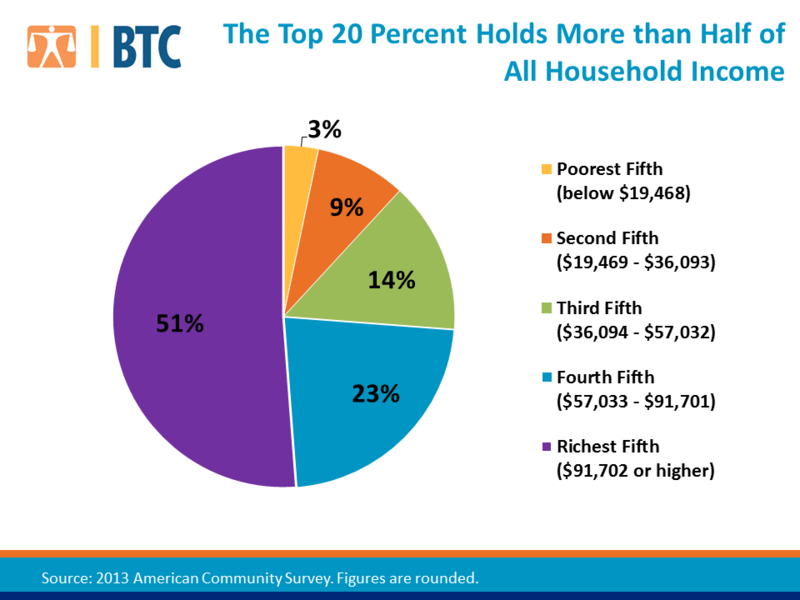 These consumers spend a larger share of their incomes on goods and services compared to the wealthy. This is a viable recipe for economic growth – increasing the income of consumers who will immediately pump those dollars into local economies across the states. Increasing income inequality also negatively affects the economic prospect of children. Research highlights that less income inequality promotes upward income mobility; however, growing income inequality is the reality. Children born to the highest income families are more likely to attend college compared to children from the lowest income families. Furthermore, children from low-income families in southern states are much less likely to experience upward income mobility compared to children in non-southern states. Charlotte and Raleigh rank among the bottom of the 50 largest metro areas in regards to upward income mobility. Ensuring that economic opportunity and prosperity reach low- and middle-income individuals and families is critical to a robust and sustained economic recovery for North Carolina. Yet, lawmakers are moving policy in the opposite direction. For example, they passed a tax plan last year that is lopsided: it shifted taxes away from the wealthy and profitable corporations and onto everyone else. This is a recipe for growing income inequality even more when it’s already approaching historic levels. Persistent poverty and increasing income inequality threaten North Carolina’s ability to compete in a 21st century economy. At both the national and state level, public policies that provide economic support to individuals and families experiencing economic hardship have eroded. The long-term health of North Carolina’s economy depends on the overall health of its residents. State policymakers can demonstrate a commitment to reducing persistent poverty by supporting public policies that benefit low- and middle-income families – raising the minimum wage, increasing workers’ rights and protections, and greater access to healthcare, for example. Addressing these issues head on will help ensure an economy that truly works for all North Carolinians. This is the ninth post in a series that takes a detailed look at the 2013 US Census Bureau poverty data released on September 18th. Previous posts examined: 1) how North Carolina is faring overall; 2) how poverty varies by race, 3) poverty by County; 4) child poverty; 5) the impact, or lack thereof, of the current economic recovery on poverty in our state; 6) the public success of Social Security in bringing down poverty rates for older North Carolinians; and 7) poverty among working-age North Carolinians; and 8) work and income supports help combat poverty. Read the entire series here. Previous PostEditorial critical of latest DENR-Duke shenanigansNext Post Could this be the most absurd and cynical anti-Obamacare argument yet?